NASA, SpaceX Aim To Launch Private Era In Orbit If all goes well, an unmanned capsule will become the first commercial spacecraft to visit the International Space Station. SpaceX and NASA have been working together to make this launch happen, navigating cultural differences between the young startup and the veteran agency. 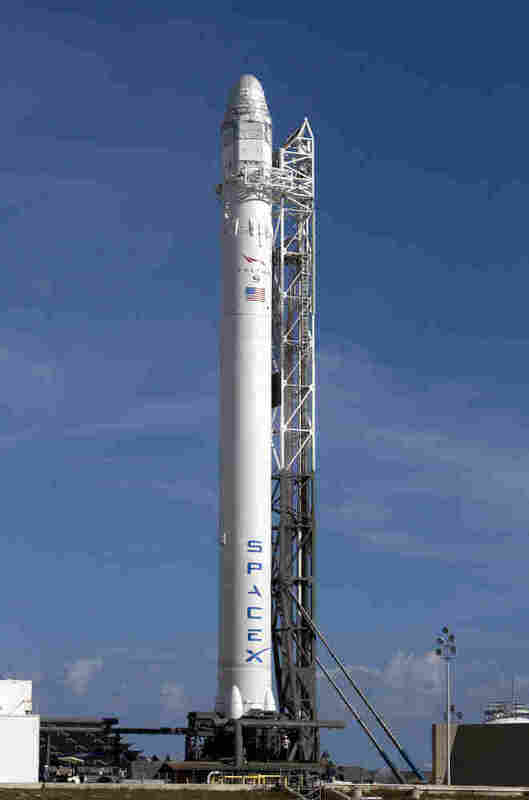 A private spaceship owned by a company called SpaceX is scheduled to blast off from Cape Canaveral in Florida early Saturday morning. If all goes well, the unmanned capsule will rocket up on a mission to deliver food and other supplies to the International Space Station, becoming the first commercial spacecraft to visit the outpost. The highly anticipated mission could mark the beginning of what some say could be a new era in spaceflight, with private companies operating taxi services that could start taking people to orbit in just a few years. SpaceX and NASA have been working hard to make this launch happen — and that has meant navigating the cultural differences between this small, young startup and the huge veteran space agency. "I feel very strongly that SpaceX would not have been able to get started, nor would we have made the progress that we have, without the help of NASA," says Elon Musk, who founded SpaceX in 2002 after making a fortune with the Internet firm PayPal. Musk says he runs his rocket company like a Silicon Valley tech firm. "That's the operating system that I have in my head of how to run an organization. And that's how I've created SpaceX," says Musk. "NASA is obviously coming from a different heritage." For five decades, NASA was American spaceflight. Now, the space shuttles are going to museums — Discovery is already in the Smithsonian. And the government wants NASA to focus on deep space exploration, while relying on private space taxis to take cargo and people back and forth to the nearby space station. NASA has been working with companies to make sure that vision of the future will happen. It has a cargo delivery contract with SpaceX worth $1.6 billion. The space agency has also been handing out plenty of advice. Musk says so far, their collaboration has worked well: "No relationship is perfect, certainly. But on balance, it's really good." The relationship involves daily calls and emails between people who live in two different worlds. For example, the workforce at NASA is generally older. Many top managers cherish their childhood memories of watching the Apollo astronauts on TV. Not so at SpaceX, where Musk says the average age is around 30. "At age 40, I'm relatively old," says Musk, who notes that he was born after the moon landing. Like other tech companies, SpaceX tries to have a flat organizational structure, says Musk. The idea is that everyone can talk to everyone else, without having to go through chains of command. NASA and SpaceX partnered closely to make the mission to the International Space Station possible. 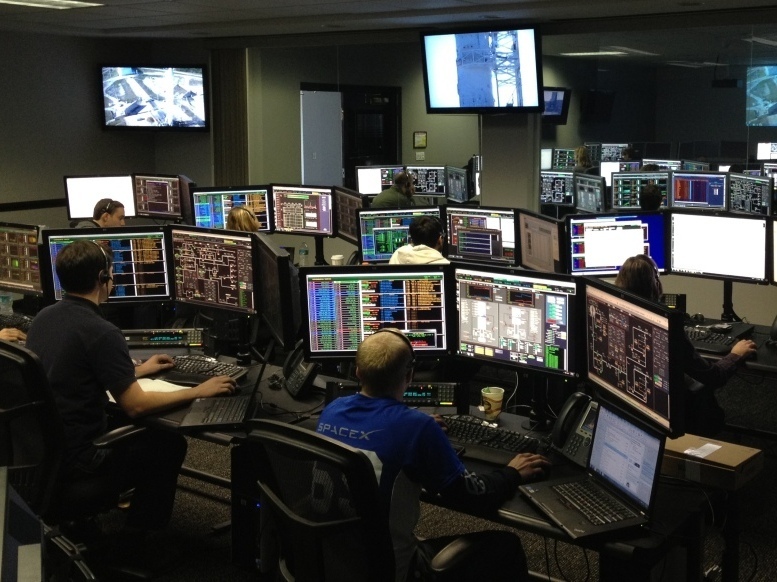 Above, the SpaceX control room. "We really try to minimize any unnecessary paperwork or any bureaucratic elements," says Musk. "I think it's also easier, if you are a smaller organization than if you're a larger organization, to be more nimble." SpaceX and NASA also have deeper cultural differences. People at NASA feel the weight of the space agency's long history, which includes heartbreaking tragedies. Wayne Hale, a former space shuttle program manager who recently retired from NASA after working there for more than 30 years, notes that "you go through life and you have experiences and bad things happen, and from those experiences you learn perhaps to be more contemplative when you have to make choices." For engineers, that contemplation means running more tests and doing more analysis. To a certain extent, that's a good thing, says Hale, but it costs both time and money. "To build a lower-cost system, you need to perhaps draw the line back and not do so much," says Hale. "And that's what we're seeing with the commercial space people." Michael Horkachuck, a NASA official who has been managing work with SpaceX, has noticed cultural differences. "They're a little bit different in that they like to build the hardware and test it, and if it doesn't work and breaks, then they'll build another piece with a little change and test it again, and not do quite as much documentation and detailed analysis as necessarily NASA would typically do," says Horkachuck, who notes that it reminds him a bit of how the Russians approach space technology. But he says sometimes SpaceX sees the wisdom of NASA's ways. "SpaceX is learning how we do things and why we do things," says Horkachuck, "and I think they are pulling some of the best ideas and methods that NASA has had and applying those to their program." One thing that makes this give-and-take go a bit more smoothly is the fact that a fair number of the approximately 1,700 people working for SpaceX used to be employed by NASA — Musk estimates that's true of about 10 to 15 percent. Jon Cowart, a NASA manager assigned to partner with SpaceX as it develops a vehicle that can carry astronauts, says having former NASA colleagues at meetings can really help when agency officials and SpaceX are trying to relate to each other. "It makes it a lot easier to find that common ground as we struggle to find the right answer on a way they plan do to something that we may or may not be comfortable with," Cowart says. Despite their differences, NASA and SpaceX share a set of core convictions. They both have an almost religious belief in the need for humans to venture forth into space, a geeky love for rockets, technical know-how — plus, they both need each other to succeed. Some people even say SpaceX reminds them of NASA, back in the good old days. "I would characterize them as almost being like back during Mercury, and Gemini and Apollo," says Cowart. "That kind of youthful, you know, young enthusiasm that you have when you're first starting something."